Fish and Chips is a world-renowned British classic dish. We recommend triple-cooked chips. Instead of frying them twice; we blanch them once, fry them once & then finish off in the oven. View the full recipe below. Sauté onions, garlic & ginger until light brown. Add the peas and cook until soft. Season with salt, pepper and Knorr Lime Seasoning before mashing with a hand blender until your desired texture. AddHellmann's Classic Mayonnaise for that extra richness. Marinade the Fish fillets with Knorr Coating Mix- Spice Marinate (100g) for 20 minutes in a refrigerator. Make batter by mixing Knorr Coating Mix – Coating Base powder (40g) and wheat flour together and sieved twice to a Tray. Mix the sieved flour with iced water gradually and prepare a smooth thick batter. 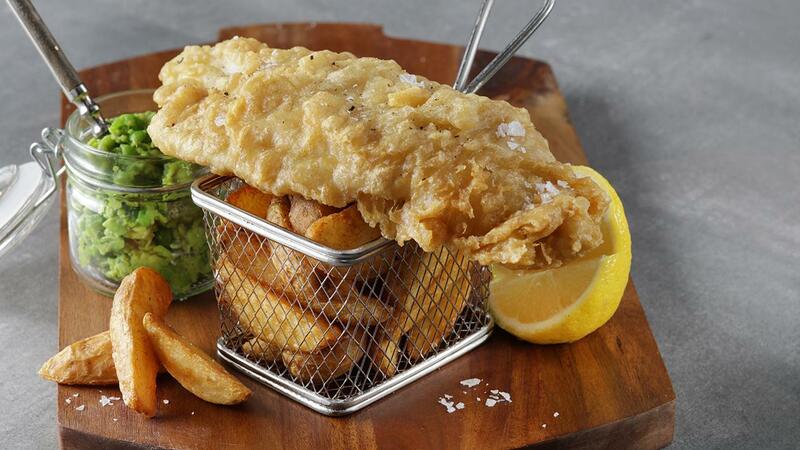 Dip the marinated fish fillets in the batter and deep fry at 180°C until golden brown.